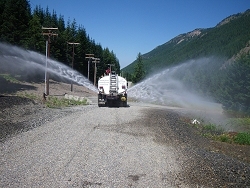 Welcome To Water Buffalo Inc.
Water Buffalo is the most diversified water trucking company in the Pacific Northwest. From top construction contractors to customers requiring bulk drinking water and more, we are the company they trust and have turned to for their water trucking needs since 1996. Receive great customer service from the moment you reach our office till your job is complete. Call us for bulk drinking water, contractor services, dust control, pool and spa fill ups, landscape/lawn watering or special effects for film production. Make a mud bog for your race, fill a dunk tank at the company picnic or have drinking water brought to your event in our portable trailer. We provide bulk water transport of any kind. Your job is our #1 priority however large or small.